Finding the right sized home is my specialty. I can buy and sell any home throughout Denton and Collin County, but what I really love is “rightsizing”. That’s the art of finding the right sized home for your needs and your budget. So what happens if your downsizing? Nobody wants to make mistakes so learning from other people is really the best way to avoid these mistakes. 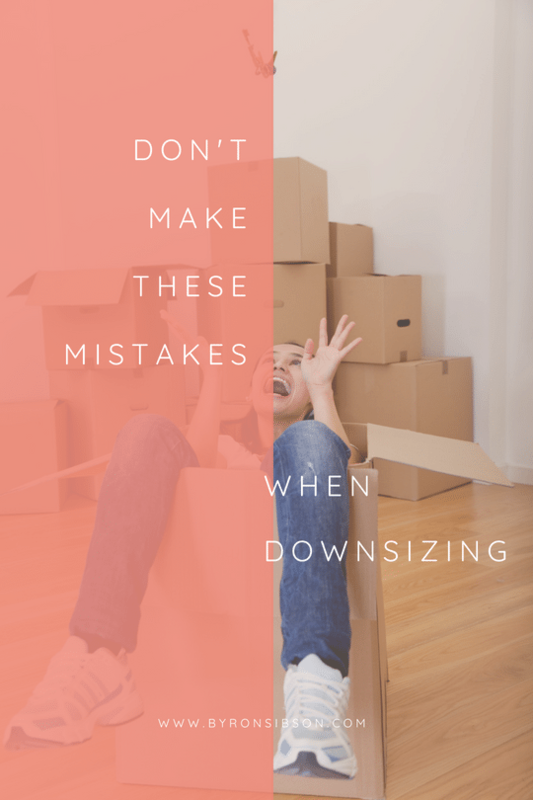 Here are some mistakes I’ve seen people make in the past when it comes to downsizing on their property size. A home is more than just an investment; it has a nostalgic and significant impact on your lives so leaving it can be difficult but putting off downsizing for too long can make the process even harder. Moving gets harder the older we get so of course, lifting heavy boxes, and doing his strenuous moving activity can really take it out of us rapidly. Consider downsizing before you know it’s going to be too difficult. If you are in good physical health and you know you don’t need as large of a home, now may be a perfect time. #2. Not preparing for the move. Choosing the right time is essential but also preparing is critical as well. Moving can be extremely stressful and it takes time and planning. The more planning you do the less frustration there will be. Don’t leave things to the last minute. Pack your house up as you stage the home for sale. Seasonal items or products and items you just won’t need until you move to the new house are perfect for packing up now. Use existing items as packing material such as old blankets, seasonal linens, and towels, seasonal clothing items, etc. #3. Not communicating with your family. Regardless of why you are downsizing, it’s important to communicate with your kids and other family members of your intentions. Are the kids going to college? Maybe they’re moving out and you will be empty-nesters? Perhaps the home has just been too big for years and it’s time to make life a little easier on yourself. Talk to those that will be affected such as adult children or older parents. Make sure they understand your need for downsizing and how much involvement you want with them during the move. #4. Trying to take everything with you. Downsizing obviously means your downsizing space so if you have a five bedroom house and you’re going to a two bedroom house, you’re going to have to get rid of some of the furniture. See what will fit in your new home and then plan accordingly either with a garage sale or donations. #5. Selling it all and starting over. Honestly, this probably only works best if you’re moving to Hawaii or overseas somewhere. Selling everything or donating it in buying all new once you move into the new house is extremely expensive. Calculate what is worth keeping and what’s not and the more you can save to transfer to the new home, the less expensive everything will be overall. Downsizing does take preparation and planning and finding the right real estate agent to help you downsize and relocate throughout Collin County is my specialty. Give me a call today and be happy to ask you a few important questions that can help make your move that much easier.